Here is new version of most flexible and quickest Joomla CCK 8.512! add - parameter to parent and child fields to allow access to restricted article for authors or of the relations. That means that you can allow users to submit children privately and only child author and parent article author will see it. This parameter makes parent article author considered as special. Here is big update of amazing Joomla membership extension Emerald 9.204. This update brings you cool new integrations. And all of them are free! We continue our tight collaboration with Stackideas. We add more integrations but even more to come. Little late this week, but anyway, here is new version of Cobalt 8.508 - the greatest Joomla CCK extension. In this version a lot of tiny fixes and stability improvements. add - records module - parameter to override article's menu Itemid element. fix - category count respect language mode section parameter. New version of Emerald 9.197 - amazing Joomla membership is here! This version contain 2 great new features. We create new cool method to activate new users. This feature is only applicable with subscription during registration. Right now in Joomla users may activate account by self through email confirmation or by admin. But what if you want users to be automatically confirmed after purchase? New version of incredible CCK - Cobalt v.8.504 is here! This version contain so many little improvement and adjustment we were able to make while configuring Cobalt on our site. This is like put a lacker on a new car. Makes thing really shiny. fix - file downloads count. fix - komento restrict comments per article. fix - comment private check uncheck. fix - records api take in account section default template parameter. New version of Emerald v.9.129 - Amassing Joomla membership/subscription components is here! This is recommended update for all Emerald users. It contain some very important fixes and improvements. add - user cannot open invoice if address not attached and user is offered to attach bill to information first. Once attached, invoice is accessible. This is for cases when subscription is created manually by admin. New version of Cobalt - CCK v.8.498 is here. This is our first update on new site. fix - category lost while editing with our rights to change category. add - komento adapter allow users do disable comments per article. Crazy discounts by MintJoomla are here! First of all we are happy to move our site to Joomla 3 series and as a result we use Cobalt 8 and Emerald 9, the latest version of our components. New version of Cobalt 8.490 - the most advanced Joomla CCK is here. Every Thursday we release updates with more and more polish. Cobalt is already shiny extension, that can be great item in collection of extensions for any Joomla enthusiast. It can give you a wings and allow you to plan for things you could not even dream before. fix - cobalt - copy type. Copy fields groups and reset template keys. New version of great Joomla membership extension Emerald 9.178. Some cool additions and enhancements in this version. add - emerald - new plan parameter access to purchase. Now you can set who can view and who can purchase separately. use may see plan but not able to purchase it until in special group. enhance - emerald - Every rule have it's own usage limitation parameter. Now if plan is used out, but rule with usage count NO, this plan for this rule is considered active. New version of Emerald 9.168 in out. Emerald is an amazing Joomla membership extension. In this version, cool new features. Now you can set usage calculation per rule, not per subscription plan. You set usage limit in plan but you may exclude some rules to calculate usages. For example you want unlimited access to read content but only 3 files to download. New version of Cobalt 8.477 is here. I have to safe with you my experience. As you all know we are working on new version of MintJoomla website. Nothing special just migrate from J! 2.5 to 3 series. Here are cool Emerald 9.160 updates on this Thursday release. enhance - K2 rule. Now restrict file downloads in indicated category. It also adds lock icon to those files to indicate that it is Subscription protected. add - invoice button in sales list. enhance - when unregistered use try to select plan, and then redirected to registration page, that plan is pre selected. We are updating MintJoomla to Joomla 3. We will have now subscription options for Emerald, which will provide cheaper price. And we will offer 35% discount coupon MINT-R3DY on all plans from 1 year long. This will allow you to purchase 1 year subscription for Emerald or Cobalt paying 6 month subscription price. This offer will work only till 20 March. So we want to inform you before, so that you have enough time to plan your budget. New version of Cobalt - Joomla 3 CCK extension 8.473 is here. fix - email field - Link to article not full and not SEF. We are happy to announce new version of Emerald - 9.156 with cool new features. AcyMailing is a great newsletter/mass mail extension. Now we have an action that will subscribe user to indicated newsletter list after successful Emerald plan purchase. It can serve as additional plan features, or you may simply use emerald to sell newsletters. New version of Cobalt CCK 8.470 is here. This version includes some cool new additions and enhancements. add - geo field added text search for address enter. add - new category index template called select in advanced template package. May works like quick navigation. New version of Emerald 9.144 is here with lots of cool updates. Now we have one click migration plugin. Akeeba Sub has dropped it's support. SO you may plan to migrate to other cool membership extension. And that might be Emerald. Meet new version of oldest and most advanced Joomla CCK component. Cobalt v. 8.464. 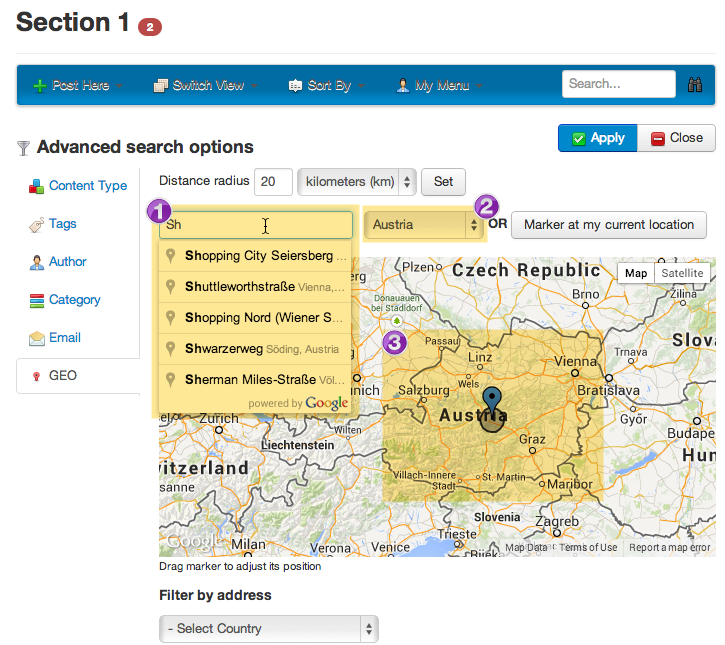 In this release field geo (Address and map) has received some new features. Long discussed and desired, address text search in distance search filter. Ajax search with suggestions from Google places service. Online education is one of the most popular trends nowadays. And to have good platform to create your online training site is very important. In this article i'll highlight important possibilities you will have with Cobalt. Cobalt is Joomla extension. Should you use Joomla for your training site? We all know what is Joomla good about. JED - Thousands of additional extension that will allow you very quickly extend your site with additional features.